Part of a large complex consisting of three hotels, the Nessebur Bay (called Radva Bay in our previous edition) is new for Summer 2004. 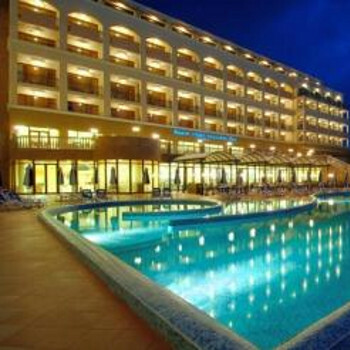 Situated between the village of Ravda and Nessebur town this impressive hotel overlooks a beautiful golden beach. After check-in (at 3 in the morning) we found that the hotel had left some bread, cold meat, cheese, fresh fruit & water in our room - a nice touch. The hotel is spotless, with good sized rooms. The pool is quite large, and we NEVER had any trouble getting a sunbed, regardeless of what time we went down. Although the complex is on the edge of the new town, it does not feel isolated, and Sunny Beach & Nessebar are both within a short taxi ride. The staff were all helpful, even those whose English was not great (but neither is my Bulgarian!). The entertainment is the usual hotel animation stuff, with a couple of professional shows on top. All in all, a good hotel offering excellent value for money, and one to which I would return like a shot. We stayed at The Nessebar Palace which is the 5* in the complex of 3 hotels. The room and sea view were great and the hotel was spotlessly clean. The food was buffet style, just about warm and nowhere near 5* standard. The wine was very basic and the white and rose often warm! The loud music was unbearable, we could hear it on the 8th floor where our room was and had to keep the balcony door closed. It started in the pool bar at 9.00 and finished at 22.00, a mixture of rap and house. The Animation team would start up in the afternoons the other end of the pool playing hideous pop music. All other areas of the hotel also played loud music and there was no escape. Complaints would get nothing done about it. The staff were young and spoke and understood English when it suited them. There were a couple of hotels that had been overbooked in Sunny beach and the guests had all been put in this hotel, it was not the holiday that they had wanted being so isolated. We had thought that we would have a quiet holiday in a good hotel, how wrong we were. We were supposed to stay there for 14 nights and lasted for 6. We managed to get the rep to put us on a flight home. No regrets, it was worth it to get away from the constant noise! We stayed at the Nessebar Palace in September 2006. This hotel is part of a chain of 3, The Bay, The Mare and the Palace (opened 15th July). The cleanliness of all three cannot be faulted even midnight cleaners either washing floors or cleaning glass doors. The food is repetative and really as a German run hotel group caters for continental European choice. This said their was always enough of a variety you could find something to eat. The location is a bit restrictive, about 20 minutes walk either to Ravda or Nessebar. There is entertainment but you have to go to the Conference Hall which is between the Palace and Bay Hotel, good points its air conditioned, bad point you have to return to your own hotel bar for a drink. Entertainment for kids all day, excellent kids entertainment team. Did find the bar staff very rude at times, you had to literally be in their face to get served. 4 star service it isn't. I think Balkan need to polish up their act as rep (nice as he was) only visited site for 30 minutes a day and info given out was suspect. This hotel was in the middle of nowhere. Forty minute walk into old Nessebar and a twenty minute walk to Ravda. If going out use the hotel taxis much cheaper. The road to walk to Nessebar was appalling especially at night. On our hotel being changed at the last minute before leaving we were very apprehensive about our new hotel. When we arrived it was pouring from the heavens and sarcastic comments were being made by other travellers as we got off the bus because our hotel looked as though it was in the middle of nowhere. Pleasantly surprised on entering the hotel and even more so when we saw our room which was situated on the top floor with excellent views across the bay. Staff at the hotel could not have been more helpful and in particular the animation team were extremely friendly and helpful. George, Eva etc were fabulous working long, hard hours both during the day and at night making every effort to ensure everyone had a great time. Our 4 year old did struggle at the kids disco as initially everything was said in German but when this was raised they made a conscious effort to ensure that they spoke in both German and English. Food in general was good, we upgraded on arrival from half board to all inclusive. Unlimited soft drinks, beer and wine if required, ice cream and snacks for the kids. Could not fault the snack facilities. Meals after the second week did become a bit repetitive but on the whole the food was good, with again a tendancy to be more geared to German taste. Lovely new hotel lots of sunbeds. Hotel is described as overlooking the beach well it does if you are on a high floor and can see over the pine trees!! Food was not anywhere near 4*. German run hotel meant all "animation" was in German. The location was a bit naff inasmuch as it was on the main road into Nessebur (20 minute walk) but there was no footpath in parts and would have been dangerous in the dark, the taxi drivers know this and are set to rip you off at every given opportunity.